Sublime Text 2 is a pretty neat text editor which will remind you of TextMate. It runs on Linux, Windows and Mac OSX and while it's not free, you can evaluate it for an unlimited period of time. 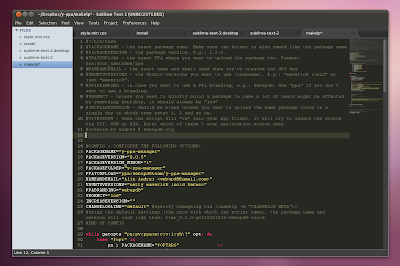 Check out our Sublime Text 2 review for more info. Sublime Text 2 is updated quite often so I wanted to create an Ubuntu PPA for a while now but I couldn't find out what license it uses. I've emailed the Sublime Text 2 developer and got no reply so I decided to package it like Adobe Flash: the .deb will download Sublime Text 2 from its website so the .deb doesn't come with the actual files. While Sublime Text 2 automatically checks for updates and prompts you to download the latest version, I like getting the updates through a PPA. Further more, using this PPA, Sublime Text 2 will get a proper .desktop file so you can right click files to open in Sublime Text 2 as well as showing up properly in the Unity launcher. You can also open files from the command line (run "sublime-text-2 /path/to/file" or "subl /path/to/file"). This is the first version of the Sublime Text 2 packaging so there might be bugs. The deb doesn't check if the download was successful; also, it will probably fail to install behind a proxy. Use it at your own risk! I've set up the PPA for personal use but of course, anyone can use it. If you find any bugs, please report them in the comments below. For what's new in the latest Sublime Text 2 builds, check out its homepage.